I think it might be helpful to also define the word liable since it is key to our experiences connected with being responsible. I’ve also noticed that the word Responsibility is used most often when something has gone wrong or there is a belief that something will go wrong. Then you will be liable (subject to adverse action) and basically be blamed for it. So being responsible is often the same as getting blamed. Then you want to practice responsibility (doing the “right” thing) to avoid being blamed. I like the part of the definition that says you are the cause! This means that when something goes right or is successful you get to take responsibility for the result. You get to take the Credit! Almost everyone likes to be acknowledged for being the cause of “good” things. Almost no one wants to be acknowledged for being the cause of “bad” things. Therein lies the key to owning or not owning responsibility (being the cause of). When things are “good”, it is easy to Own It (being the cause of). When things are “bad”, it is difficult to Own It since you are expected to take the Blame! Since almost no one wants to take the Blame, we need a system to handle this situation and the Mind has one… a very good one. Before I go more into that system and how it works, let me get back to the definition that I will be using. We define responsibility as owning the power and ability to create, choose, or attract. This reveals the central issue in demonstrating responsibility when something goes “wrong”. It is not whether you have the power to create, choose and attract, but whether or not you OWN IT! To explain a little more about what it means to create, choose, or attract. Let’s say you want a cherry pie. How do you get it? First, you could Create it. You would get your favorite recipe and head for the store to buy the ingredients. Once home, you follow the instructions in the recipe and bake it. Now you can take responsibility for having created a cherry pie. Next, you could Choose it. This is a different way to make it happen. You would go to your favorite pie store and look at the possibilities and choose the cherry pie that looks best to you. Again, here it is easy to own that you have taken responsibility to have chosen a cherry pie. Finally, the one that is for many people the more difficult to understand or even believe is possible. You sit around imagining how wonderful it would be to have a delicious cherry pie. If you imagine it powerfully enough, someone is likely to show up with one to give to you. Yes… we are talking about the Law of Attraction here. You caused a cherry pie to appear but are likely to have a difficult time owning that you were responsible for it being there for you because you Attracted it. That is unless you fully realize that many things in life come to us in this way. The Responsibility Model provides a framework for learning by individuals and organizations. RESPONSIBILITY - Owning the ability and power to create, choose, and attract. When a person is taking responsibility as defined above, that person is said to be "above the line" and when not, the person is being "below the line." Responsibility (above the line) honors and uses personal power. Lack of responsibility (below the line) gives power away. No learning takes place "below the line." 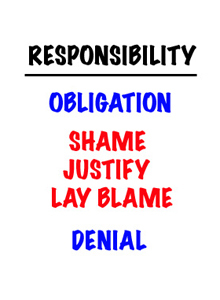 Primarily, the Responsibility Model is most useful when self-applied and should not be used to "Lay Blame" onto others. When things go wrong, the mind first responds with "below the line" thinking. The KEY is to be aware of where you are "below the line" and to work your way back "above the line." The KEY QUESTION is "How am I creating, choosing, or attracting this?"